Ahhh-flying-saucer-shooting-star-CHOO! Laughter is the best medicine when you're a little alien feeling under the weather. Little Alien is sick. 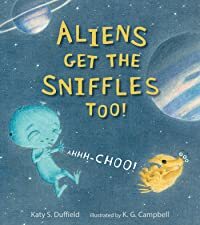 And sick is extra-terrestrial bad when you have two scratchy throats, five ears that hurt, and three runny noses. Splatch! Sputter! Spurt! Luckily Mama and Daddy Alien have an arsenal of lunar decongestants and meteor showers on hand to make him feel a little better (not to mention a Milky Way milkshake to help the medicine go down). Even so, the family's alien pooch, Mars Rover, can't stand to see his little buddy feeling out of sorts. Can a loyal pup's funny tricks finally coax a smile?